Miro is an open source Internet TV that can download videos for you, and also have them saved and aggregated for your offline viewing. It has recently changed to 2.0 version with added features and full HD video streaming capabilities. 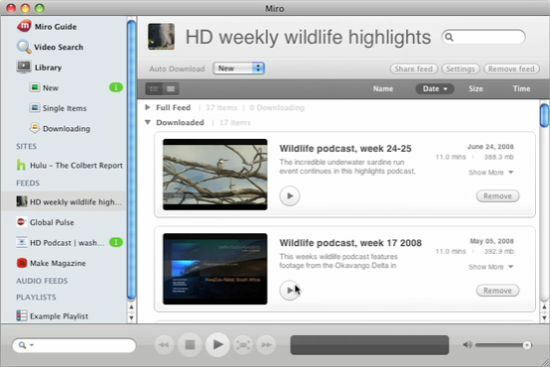 Miro 2.0 is well known to show any TV show off the internet, and now has the ability to show full screen, HD Internet TV shows and video podcasts that you can view or download and view anywhere and anytime, stored into the Miro interface. Beautiful Interface – And Miro challenges to provide videos better than any website that streams videos for you on the web. And watching every HD video in fullscreen version is a good added feature. Addition being ability to play any type of video like mp4, avi, wmv, mpeg, xvid and more. This is a mac application that you can download from the website and it has no relation with your browser. Similar software we shared earlier was Tooble, but Miro is something steps ahead of others. Plays and downloads torrent files – Using BitTorrent and downloading torrent files is easiest through Miro 2.0, and the BitTorrent RSS is a feature with which every episode in future of the TV show gets automatically downloaded and stored when its published on the web. The torrent performance is powered by the Libtorrent engine which makes search of torrent files and download faster and easier. Downloading from Youtube, Blip, Google Video – Downloading youtube videos, or videos from Major video sharing websites by just searching for the keywords. And as lately Youtube has added HD support, the video quality in Miro 2.0 has become a lot better than before. Apart from downloading, you can also publish and share videos through Miro app. Miro 2.0 also resumes the video playing from where you have stopped watching it, and you can set the option to view videos in a succession or stop video playing after one finishes. You can check the list of features in this page. You can alternatively download the video player Miro from here. Miro 2.0 really is a great piece of programming that i use loads, and it makes my video managmkent tasks alot easier! and where is the button to download on this page? ?